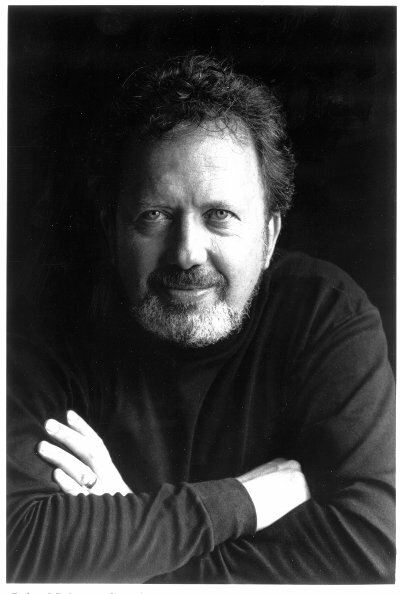 John Nelson Interview with Bruce Duffie . . . . . .
Born in Costa Rica to American parents, John Nelson studied at the Juilliard School where he won the Irving Berlin prize in conducting. He has held the title of Music Director of the Indianapolis Symphony, the Opera Theatre of St. Louis, and the Caramoor Music Festival in New York. He has also been Principal Guest Conductor of the Orchestre National de Lyon and Artistic Adviser to the Nashville and Louisville Orchestras. Presently (2009), he holds the title Directuer Musicale Honoraire of the Ensemble Orchestral de Paris. More details about his life and career can be found in the box at the end of this presentation. 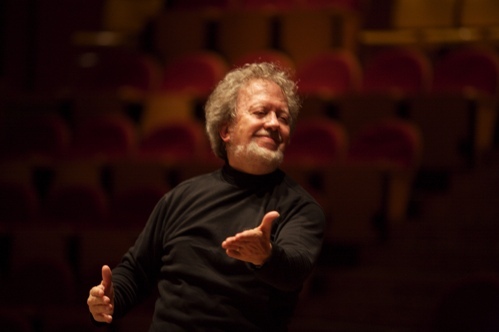 Nelson has conducted in The Windy City on several occasions, and for a trip in the fall of 1993 his task was Don Quichotte, the setting of the Don Quixote tale by the French composer Jules Massenet at Lyric Opera of Chicago. He graciously took time from his very busy rehearsal schedule to speak with me about many things. We met in his apartment, and while we were getting ready, the chat turned to various singers who crossed over into the instrumental world . . . . .
John Nelson: Tenor Giuseppe Sabbatini was a bass player in the Rome RAI [radio station] orchestra! JN: That I didn’t know. JN: When I was in Aspen once, we almost put together a Liebeslieder Waltz of Brahms, with two singers that were pianists playing the piano part, and then four instrumentalists, including myself, as the singers. [Both continue laughing] Just completely reversing roles! BD: When I was in music school, we had our major instruments, and then we would play several minor instruments. The Dean encouraged us to play our minor instruments at pep rallies and basketball games. It was good fun — and a learning experience — for a bassoon player trying to scrape away on a viola! [Gales of laughter] [Turning, a bit reluctantly, to the business at hand] Well, let us start right there. How do you as the conductor deal with unavoidable replacements in a cast? JN: It depends on the opera company that you’re with. If you’re with a company like this that has good people as covers for the full run, then you’re in good shape. For Don Quichotte I’ve got every part covered, and I’ve had a rehearsal with all the covers. They’re ready to go! There have been experiences in my life that have really been very, very difficult! I’ve never had to cancel as a result, but I could write books about a couple of experiences that I’ve had that were really difficult, very tenuous. BD: Give us one juicy example that worked out well. JN: In Eugene Onegin my Tatiana got sick in the last act. BD: She had done two-thirds of the performance? JN: Two-thirds of the performance, just the last act to go. This was with the Opera Theater of Saint Louis, which is a marvelous company, but full of young people! And they don’t cover their people, particularly. Sometimes they cover somebody, or somebody’s role with somebody in the chorus. In this case they just had someone who was interested in singing and learning the role of Tatiana, but had not prepared it in any official way. So I taught her the third act in fifteen minutes. JN: With the score, obviously. The lady who had lost her voice just acted it out onstage, but she had absolutely no voice! So I had to feed this lady in the pit. She was a young kid in the chorus. She was at Boston University during the year, and this was her big moment! It got caught by the papers, somehow. There were some reviews and even notice got back to Boston in the Boston Globe that this little gal had sang the third act of Onegin. BD: So you had to rebalance everything, because you’ve got a voice in front of you instead of twenty feet away on the stage? JN: [Laughs] I’m afraid I didn’t worry a bit about balance because I had to feed her notes, rhythm, everything! I had to play the game of charades with her. BD: You should have had an assistant prompter right there beside her. JN: I don’t believe in prompters. JN: I don’t like the practice. This will leave me in bad stead with the Chicago because they believe in prompters, and they have very good prompters there! JN: Excellent prompters! I love the gal who’s doing my show, but the singers get dependent on them. It’s a crutch that really is not needed, and in some cases it produces negative results. BD: You would rather they be dependent on you? JN: Dependent on themselves! Inspired by their own knowledge and immediacy with the action! If they need help, I will give it to them, sure! BD: So you want them completely prepared? BD: Then where should the inspiration of the evening take over and make a fiery performer? JN: You just go beyond preparation. That’s why performances will never die in this age of CD’s and radio performances and everything. Performances will never die because people want to be a part of a live situation! You will never hear June Anderson singing Traviata like she did last night! You never will! You can get it on a CD and you can listen to the same performance for the rest of your life, but it’s not the same! BD: Even a recording of that very performance would not be the same as that performance? JN: It would not be the same at all because you never know what the next moment is going to bring! That’s the excitement of it. You don’t know what the inspiration of the moment is going to do. I believe in total preparation, but I probably believe more in the spirit of the moment to make something real, to make it come across, to make it communicate, to make it alive! People pay ninety dollars or a hundred and twenty dollars — sometimes three hundred dollars in Japan — for an opera performance. So it’s got to be special! It’s got to be alive. It has to communicate something that nothing else quite can! BD: In rehearsal, or do you purposely leave something for that spark of the evening? JN: You can never do everything! I would like to answer that question by saying I try to accomplish everything in rehearsal, but you never can! You never will. A performance will never be perfect; that’s not the idea of a performance, to have perfection. That’s not the idea! BD: But you strive for it? JN: That is not what it’s all about, but you strive for it, right. You know you’ll never get there, so there’s always room for some kind of adjustability or improvisation or spirit of the moment. BD: You’re the conductor, so you’re the one, theoretically, running the whole show. How far out of hand do you let it get? JN: Not very far. Not very far. Then I think I’m not doing my duty. There’s this great matter of structure that one person has to be in control of! Sam Ramey in Don Quichotte cannot be in charge of the structure of this piece, even though he sings in all five acts and it’s virtually a one-man show. He cannot be! It requires me to do that because I begin and I end, and I play every note in between. I’m responsible for the “interpretation” of the evening, and part of my job is to make it all come in tightly! I think the best speeches, the best books, the best music — except for Mozart [laughs] — is music that was thought out, that was carefully sculpted. Think of Michelangelo and the way he sculpted these extraordinary works of his. He said he discovered them as he was doing it, but the immaculate attention to structure and detail is just fantastic! You can’t leave art to chance. BD: Are you standing in, then, for the composer, to make sure that his or her structure is there and not disturbed? JN: Yes, sir. Absolutely! My god is my composer. If I serve myself or if I serve anything else other than the composer, I feel like I’m being dishonest as an artist. It doesn’t mean that I’m not going to bring my own personality into it or allow other people’s personalities to come into it. But it must all be to the service of the composer. BD: And the composer is always right? JN: No. That’s an interesting question. I would have to bring my experiences with living composers to answer that question. I can’t argue with Beethoven, can’t argue with Dvořák, can’t argue with Massenet. BD: But you do want to argue with the living composer that is here today? JN: Absolutely! Sure! And the best of them would want the input of the performer. Remember Joachim and what did he do to the Brahms Violin Concerto? I think composers, by and large, enjoy the inputs. Look how pieces have changed over a period of time because of various factors when the composer has been involved. Look how Rossini was doing his operas in so many different places, or Verdi doing his operas in so many different places, every time changing a bit. BD: Then once the composer dies, is the piece frozen forever in that one last form? JN: Well, that’s another interesting discussion. No, I don’t think so, because then you simply become a museum of old art. But how far does one go along that road is a question, isn’t it? JN: That’s taste. Of course it’s taste. Peter Sellars, bless his heart, takes these Mozart operas and puts them in Nicaragua, and that’s the style of the day, to update, upgrade all these pieces. BD: Do you think Mozart is applauding from heaven? JN: I don’t know. I really don’t know! I think it depends on how it’s done. BD: Because you believe in all of this so strongly, do you get involved with the producer and the stage director and the scenic designer early on, especially if it’s a new production? JN: I like to do that. It’s a luxury that not too many conductors have an opportunity to enjoy. I do very little opera, actually; this is not my main work. I do two productions a year, and I try to limit my productions to the ones that I can have some say in at an early point. And I try to limit them to the companies where I feel comfortable. This is my first time in Chicago. I was originally engaged to do another opera in this period, but it had to be cancelled (for good reasons), and I was brought in at an early stage of this replacement so that I could discuss cast and interpretations. BD: You only do two productions a year, but that takes a great deal of time. JN: It does. That takes three and a half to four months of time, generally two months per opera. BD: So that’s a third of your life. JN: That’s a third of my life that is spent in opera. It’s a lot! But in terms of engagements, that’s two. A comparable period in a symphonic life would have eight to twelve engagements. BD: Do you prefer going for a couple of weeks to symphony, rather than just a single week? JN: I like as much as possible to be with one orchestra for two weeks, which actually is a rare experience. When you are not music director of your own orchestra — which I am not at this time; I’m a freelancer — then by and large I go one week to one place and one to another place, and so on. But on occasion I’m able to stay with one orchestra for two weeks. Then you have some continuity, and you develop a relationship. BD: Can you develop a relationship if you return to the same orchestra year after year after year? JN: Of course! Oh, yes! I love to do that! They know you and you know them. You know their capabilities and they know your limitations! [Laughs] And it’s always easier the second time around. Right now, at my stage of career, it’s rare that I have a debut. It’s usually going back to places that I’ve been to before. BD: Are you at the stage in your career that you want to be at this age? JN: Yes, I am. One is never completely content with where one is. I think that would be dangerous, if I were totally content. I’m at peace about where I am and I’m having a great time! It’s a very challenging life to be in front of a different orchestra every week! You constantly have to adjust to a new set of faces, to a new personality. Every orchestra has its own personality. BD: Do you try to mold them in your image, or in the composer’s image, or just let them dictate how you will play the music? JN: Certainly not the latter. I think it’s a combination of the first two. I certainly want to do the best for the composer, be honest to his period, his nationality and his kind of thinking and so forth. But it’s inevitable that one is going to bring one’s own personality into it. I’ve found from my experiences, as we were saying before, composers who are living are anxious for you to make it come alive! BD: So you work a lot with the living composer. Do you try to put a new piece on each, or most symphonic programs? JN: I certainly put twentieth century music on most every program, but not always living composers. I don’t have any kind of rule about doing that. I’m not a Dennis Russell Davies; I’m not a Pierre Boulez. These people have special gifts in contemporary music. I don’t think that I have any enormous gift at divining what the present should sound like, but I do have my favorite composers and people that I really believe in. I love to do their works and I do them as much as I can. BD: Does it please you now that these composers have gone on to make even larger names for themselves? JN: Of course it does! Of course it does, sure. BD: Do they have loyalty to you, and try to give you important premieres? JN: I think so, yeah. Of the three names I mentioned to you just now, there’s been a kind of a reciprocal relationship, and very nice. It’s very exciting to be part of the real creative process! I’m a re-creator, not a creator. So when one is involved with a first performance, it is really very, very special. You’re bringing something to life that nobody else has heard, and it’s just simply thrilling! BD: Is it more important for you as a conductor to give the work that second and third performance? JN: That certainly is important for the composer, because we live in an age where we throw away things so quickly. BD: ...it’s that second and third. JN: It’s the second and third. I certainly will do that for pieces that I believe in. I will do that a lot! I’ve done that for all the composers that I mentioned just now. As we speak, I’m working on a project for Gorecki. I’ve done a number of his works and I’ve recorded his things. I’m working on another recording and am also in the process of commissioning him to do something new. It’s thrilling to bring new music back, over and over! For me, the true test of the greatness of a piece is how well it lasts in your own mind. Because we all have highly sophisticated minds and feelings, musicians have been spending our lives in this, or listening to it. Our sensitivities are very sophisticated and we tire very easily, but great music you’ll never tire from! Never! I guess it’s possible to play a Brahms Fourth for twenty-four hours and you don’t want to hear it anymore. That’s not the point. When it comes time to listen to it again, you can’t wait to hear it! You discover new things. You listen to it a third time and it is like you never heard that before! You listen to it a hundred and fifth time and it is still alive, giving you back much more than you give it! That’s a sign, for me, of great music. And I’ve found that to be the case with some of the contemporary composers that I work with. BD: But you can’t possibly judge this before the world premiere, can you? JN: Not at all. You can’t! Maybe there are people that are more gifted than I am, that would be able to divine that, but I don’t think so! I can read a score without playing it at the piano. I can just see it and I can hear it. Any conductor has to be able to do that, otherwise he’s not worth very much. But whether you can hear the real greatness in it, or you can hear the overall structure, that’s something else! BD: Is it the richness of the orchestra that brings everything to it and fleshes it out, rather than just the pitch and duration shown in the score? JN: Of course it is. A good conductor should be able to imagine that and hear all the colors in his ear as well, but not to the extent that a performance would give you, especially in front of an audience. When there’s an audience behind you, you always feel like there’s this something, this body behind you that is listening! So it piques your own listening capabilities, and you can sense when the tension has been released or is gone. One can sense it, either by no more finger rapping or the things going on such as people snoring or whatever. When it’s real quiet, you know that you’re really getting to the audience, and when there’s a bit of rustling here or there, you know that either you are not doing the music justice or the music is not sustaining them. A performance can tell you about the worth of a piece in that way. BD: Are you conscious of this behind you all the time, or is it just something that comes and goes and the rest of the time you’re absorbed in the music and performance? JN: I think the latter. Sometimes you’re just simply wrapped up; you don’t know where you are except in the music. It doesn’t happen very often. No matter what we would like to think about ourselves — that we are above the audience — performers are very conscious of the audience. And we should be! Communication is a big thing! There is, of course, Glenn Gould, who didn’t like to do things except on recording, and then there are people like Sergiu Celibidache who doesn’t like to record and only does things in front of the audience. I think the audience is a very, very important part of this whole process. BD: You mentioned recordings. Do you conduct the same in the recording studio that you do in the concert hall and the opera house? JN: I’m afraid I would have to admit that I don’t. I would like to try to conduct the same; certainly the intention is to be the same. I think the ideal is to somewhat forget the enormous pressure of recording for posterity and be caught up in the flow and the drama and the communication of it. But that’s very difficult to do when you’ve got either television cameras staring you in the face or you have microphones all around, and you know that this is being put down for posterity. After a while, you begin to record more as a performance and not let that kind of thing influence you. I can remember when I first began recording, the tension was great! Now I do a recording session and it’s virtually the same as a performance. One is more conscious of detail, more conscious of “perfection,” so it’s easy to lose a sense of line in that. BD: Would you prefer to actually record from concerts? JN: No. I’d rather record just the way we all record, because I feel if a sense of drama, a sense of continuity, a sense of structure is of paramount importance to you, you will achieve that in a recording, even if you record things sectionally. You know, just record a phrase, stop it, record another phrase, stop it. You can train yourself to have such a feeling for that phrase, the way it continues to the next one, and you can do it. BD: Do you always make sure that the group in front of you, though, has played the whole thing top to bottom? JN: Of course, of course. Absolutely, yeah! BD: So even they, then, know where each phrase fits in and how it will link to the next one? BD: I hope there’s not too much cut and paste in your recordings. JN: No. You hope that there’s not. It really makes no difference; the result is a really fine result. There really should be no difference. For instance, Handel’s Semele, which I recorded with Kathy Battle was recorded in nine days, which is a very short period of time to record. BD: But of course, that opera is number, number, number, number, number. JN: Number, number, number, number! Yes, but if you listen to the recording, you will find that it is connected in a fantastic way! And excuse me for saying so because I didn’t have everything to do with it! It is connected as drama! The distance between the numbers — the arias and recitatives and so forth — is very carefully timed so as to give you a sweep. If you begin listening to it, you will not want it to end; you will not want to turn it off until you get to the end. BD: So the producer had a good ear to make sure that all of the pieces were in the right proportion and the spaces between were just right? BD: You were involved in that? JN: Oh, absolutely! I’m always involved in the editing. BD: That’s good. Some conductors leave that to the producer. JN: No, I’m sorry. I would never do that because I think those are musical decisions. BD: And you’re making all the musical decisions? JN: Absolutely! It has to have a center. A performance has to have a center to it. BD: I say that rather offhandedly, but is that true — are you making all the musical decisions? JN: Of course not. You will have a flutist who will have thousands of decisions to make within his world of flute playing. He will have to decide where he breathes, and the dynamic within a particular phrase is entirely his! But he’s got to fit in to the overall line that I have given it. So I have complete control over the line of a piece from beginning to end. BD: Do you ever feel like you’re one of these guys at the circus who are spinning twenty plates on those tall sticks? JN: Those guys are geniuses! [Both laugh heartily] Yeah. It’s somewhat that. People sometimes wonder, “How can you hear that? How can you hear all of that in one note?” You have to! Everyone has his or her area of virtuosity, no matter what they do. Even people who sweep streets, there is a certain virtuosity to that. I have a virtuosity in my world. I can hear pretty much everything that goes on in front of me if there are a hundred and nine players. BD: Are we in the age of the virtuoso conductor? JN: I think we have been, yes. That’s not a good thing, necessarily, is it? BD: It’s one of those famous two-edged swords. JN: Yeah, but we’re also in the age of the virtuoso stage director. The stage director is more important than the conductor nowadays, and that has its benefits and disadvantages. The age of the super conductor, virtuoso conductor, means the conductor is all. I’m not too sure musicians in the orchestra feel very good about that. BD: Will we ever come back to the age of the virtuoso composer? JN: I think we are certainly closer to it now than we were twenty years ago. BD: Are you optimistic, then, about the future of music? JN: [Sighs] I don’t think so, no. I think so many things are fighting against quality, and there’s no training in the school system now for music in general. There’s very little training in the school system. BD: You mean training for audiences? JN: No, training! You can’t sing in a choir in a lot of high schools. There’s no orchestra. Seventy-five percent or more — I don’t know what the figure is — but I think it is about seventy-five percent of high schools don’t have any orchestra! They all have their bands that play at half time in football. But they all play boom, boom, boom, boom, boom! They don’t have the experience of the flexibility of wonderful music! That’s not being given in high schools. So I’m pessimistic about that. One takes a look at the orchestra. How can you be optimistic about the life of the orchestra in our society? BD: And yet we’re turning out so many brilliant players at Julliard and Eastman, and all the rest of the conservatories. JN: We are. That’s a very strange circumstance. But I think you’d have to analyze the ratio of Far Eastern players and Far Eastern students that come to our universities. Look at any major conservatory and there would be fifty percent either Japanese or Chinese or Korean because they’re thirsting for it over there! We’re not. We’re not competing with them. BD: So it’s eclipsed in the West, but it’s still on the ascent in the East? JN: Sure it is. Sure it is. So that’s not something to be very excited about, at least in our own America. BD: Well, in the time we have left here in the West with music, is the kind of music that we’re talking about — the concerts and operas — are these for everyone? JN: No. I think they should be available to everybody, if that’s what you mean. As a music director in an America city, am I to expect or to treat my community as, “You’re not really experiencing life unless you’re coming to hear my music”? I really can’t say that. I think the music that we have, classical music, is high art — which is a term a lot of people would hate — cannot be appreciated by everybody. Shakespeare cannot be appreciated by everybody. Whether it should is a difficult question to answer, and I think if I had to answer it I would say no. BD: What advice, then, do you have for the audience coming to hear tonight’s opera or tomorrow’s symphony concert? JN: Just sit back and enjoy it! Loosen yourself! Try to come without prejudging thoughts, and just let it have its liberating effect on you! There’s so many people I speak to that just feel classical music is something above, or something that’s so narrow or so super-sophisticated or so fussy, so detailed, so separatist! BD: It’s not any of those? JN: It is some of those. It is! I think anything that is of very, very high quality simply means that very few people are going to appreciate it. BD: Can it be enjoyed on many levels — on the superficial level and on the deeper level and on the profound level? JN: Yes. Certainly Mozart is a case in point. It can be enjoyed by a child but it can be appreciated by Einstein. And that is truly great! Not all composers can fit into that. A lot of composers are very self-conscious about their complexity, but Mozart was not! He had a great sense of humor; he was earthy and he was heavenly! He was everything in one person, almost, because his music really speaks to such a variety of people. BD: Do you have any advice for composers coming along? JN: I would say listen to your own voice, and I think that by and large people are doing that nowadays much more than they used to. At an early age it’s easy to try to sound like somebody else. But when someone is mature and at home with themself, he just becomes himself. Then the real part of him comes out, and that communicates. BD: Perhaps the hardest (or maybe the easiest) question of the three — what advice do you have for conductors? JN: ...but there are a number of my colleagues that when you come away from a performance, you’re simply impressed by their presence, and not by the presence of the composer. BD: They take it away from the composer and bring it on themselves? JN: I think it’s very, very easy to do that in this age of the virtuoso conductor, by either your motions or your distortion of what a composer wants, so that it brings attention to the performance rather than to the depth of the music. If you’re doing Berlioz, you want to have incredible, flamboyant color in it because this is who he was. But if you try to make a Brahms symphony sound the way the Berlioz Symphonie Fantastique should sound, you just have things upside down. You’re superimposing something on it. So, for my colleague conductors — or any performer for that matter — I would remind them that we are re-creators. We are in the service of the composer. BD: In spite of all of this, is conducting fun? JN: Oh yeah, enormous fun! Enormous fun! I know of one dear man... I just love him so much, but he’s always working so hard and having such a difficult time of achieving! For him it’s work, work, and it’s heavy, heavy! I feel like he’s missing out! BD: Is he missing the forest for the trees? JN: I think so. If you take the word “creation,” in the original Hebrew it has — as I understand it — a connotation of dance and of singing and of joy! So the creative process is something joyful. It’s not that we can’t be Brahms. We should be Brahms on occasion; Brahms is a very serious composer, a North German, a man that rarely smiled, and that’s fine! But the basic creative impulse should be a joyful one, so therefore the act of performing should be a joyful performance. Nobody wants to come and listen to something that is just negative, heavy, dark, serious. BD: And yet practically every opera winds up with several people — or at least one person — dead. BD: You’ve kind of gained a bit of a reputation for doing French opera. Is there a secret to doing French opera? JN: I presume there is. I’m more known for doing Berlioz; this is kind of my entrée into French music because I did so much Berlioz. I’ve done so much of it; he’s been kind of my patron saint in music. I’ve also done quite a bit of French opera besides Berlioz. Is there a secret? I think what has helped me — the only thing I can say — is having lived in France for quite a bit of time, so that I have really fallen in love with French culture, French architecture, French landscape. I don’t drink wine, so I can’t speak to that, but at least enjoying the products of the earth in France. It is such a gorgeous country! If there is a secret, it is that one has to enjoy the outer part of life. That is what one sees, what one feels, what one hears. All the senses are heightened in French culture. It’s quite a different way of enjoying. One has to feel comfortable enjoying the flesh, enjoying the beauty that one sees, enjoying the outer surface of things. BD: How is it different presenting French music in France, and French music elsewhere? JN: That’s an interesting question. The French are pretty hard on themselves as a people. JN: Yeah. They love German music, and you can’t say the same about Germans! Germans don’t particularly like French music! But the French are rather hard on themselves. So therefore they do not do their own music particularly well. I’m always asked, “Why are you so successful when you come to France? We treat you as our conductor. You do all our music, and you do it better than most of us do it. Why is that?” There is something about acceptance, or falling in love that has a great deal to do with performing. I love the French music that I do, and a French person kind of doesn’t. They do it because they have to! BD: It’s given to them, but you have found it? JN: Exactly! Exactly. That’s beautifully said! BD: You’ve done several of the Berlioz operas. Do they translate well as theater? JN: Oh, yes! Oh, brilliantly! Brilliantly. The three operas that he wrote are all very different. The Trojans is an epic. BD: Can that really be done in one evening? JN: Oh, sure. I’ve done it one evening and I’ve seen it done in one evening, and it should be done in one evening. It’s the only way it should be done. Do it in two nights and you lose something. BD: But it’s not a tired businessman’s opera, is it? JN: No, I guess not. But is Parsifal? I think you have to come wide awake. BD: So if you think of The Trojans, you do that in the same kind of way that you would do Meistersinger or Götterdämmerung or Parsifal — it has to be a separate kind of thing. JN: Oh, yes! It’s an enormous undertaking! It’s an epic opera that treats an enormous subject over a long period of time, and one has to give oneself to it. I personally feel every note is valuable in that piece, and I’m one of the few people that believes so. But I know it very, very well, and for me it is very, very satisfying to listen from beginning to the end in one sitting. It’s had enormous success in Paris, in New York, in Los Angeles, really all over the world now. In the last twenty years we’ve had a number of performances of it. But then you have Beatrice and Benedict, which he wrote at the end of his life, which is just a little eighty-minute morsel! He said it’s a piece that was written with the fine point of a needle. And it is utterly charming, and the other extreme from The Trojans. Then you have Benvenuto Cellini. BD: Does that drop in between the two poles? JN: Yeah, it does. It does. It is a fantastic piece and very, very difficult to produce, very difficult to conduct and to sing. Everything about it is difficult. JN: Because he was a young man, bursting with energy, bursting with ideas, and he couldn’t control them. Didn’t have any of his own experience to know how to cut and bring this all within the framework of an evening. BD: Knowing The Trojans and knowing Beatrice and Benedict, could you help to reshape Benvenuto Cellini? JN: Yeah, I have done it. In several productions I have reshaped it — but not by choice, usually in consultation, or at an urging from a stage director. If and when I record the work, I will do it not only in its entirety, but with all the extra music that was written at various times. BD: On the CD, then, we can sort of mix and match ourselves? JN: A little bit of that. We’ve had experience with the “choose-it Messiahs,” and all of that, right? [Both laugh] All I know is that I would like to have all of the extra music on one disc, and then give the Paris version a straight run-through. I think it’s a brilliant work, but just simply difficult to produce! BD: Is it worth it? JN: It is very entertaining for the audience! Oh, yes! Benvenuto Cellini was a historical figure. He was the goldsmith and sculptor of the Renaissance who wrote a two-volume autobiography which is a classic. And the opera has some of the more salient experiences in this life. It is absolutely fantastic! BD: If you were coming to see Benvenuto Cellini, is it helpful or a hindrance to have read the two-volume autobiography? JN: Oh, helpful! My, my, yes! BD: I ask because sometimes the operas are so far removed, it’s better not to clutter it with other versions or details. JN: Yes. Well, this is somewhat far removed. Berlioz takes artistic license with his life, but I think one would be more fascinated, more interested, if one had a good sense of who the real character was. BD: Where does Massenet fit in with all of this, in terms of French opera and French music? JN: Well, Massenet was the French Verdi, wasn’t he? I mean, he was the darling. BD: He wrote a whole pile of operas. JN: He wrote a whole pile of operas toward the end of the nineteenth century and beginning of the twentieth century. And we do not know very many of them, some people would say with good reason. It’s colorful, sensuous music that deals beautifully in detailed areas, smaller areas. The stories that he addresses, like Le Cid, and Thaïs, and Esclarmonde don’t quite match the music because the best of Massenet is the more intimate moments. The last act of Don Quichotte is just phenomenal! It’s so gently, beautifully and atmospherically written that you want to just burst into tears at the end! It really is very moving. But when he gets to these grandiose subjects, then there’s something that doesn’t quite connect with his music. But I really enjoy his music very much. I’ve only conducted Werther and Don Quichotte. I was to conduct Cendrillon but I got sick, so I didn’t do that. Those are the only two Massenet things I’ve done. BD: Do you look forward to conducting more Massenet? JN: Oh, yeah. I would very much like to. I relate well to him. I enjoy the color and the intimacy of the music. BD: Are there other great French opera writers? JN: Even though I’m called a “French opera conductor,” I’m not an expert like Richard Bonynge or some others. [See my Interview with Richard Bonynge.] I don’t know Meyerbeer particularly well. The Rameau operas are wonderful. I’ve heard several of them and the Lully things that have been done recently. There’s a whole school of French baroque which is wonderful! We have Saint-Saëns and Gounod and Bizet, and of course, the greatest of them all, Debussy with his Pelléas et Mélisande, and a couple of operas by Ravel. The repertoire is not as present as the Italian repertoire in our own contemporary repertoire. BD: Is that really reflective of its worth, or is that just the lack of French P.R.? JN: My, you ask difficult questions! [Laughs] It’s a wonderful question. I think it has more to do with style and the ethos of our time. It was all the rage back in the days when it was written. Massenet was all over the place. BD: He had a huge history here in Chicago from 1910 to 1930, when Mary Garden was here. JN: Of course, with Mary Garden! She sang Le Jongleur de Notre Dame! BD: And many other roles! JN: We are in a Massenet revival, there’s no question about it. It’s being done all over the place. Even in this country, there’s a lot of Massenet being done, so maybe it’ll come back. But each country has its art form, doesn’t it? Italy is the operatic country, whereas Germany is the symphonic country and France is the ballet country. It makes sense because of the values in those various societies. Why is it when you go to Paris — I have to be careful of who listens to this — one doesn’t really want to listen to a French orchestra doing the basic symphonic repertoire? BD: Because the basic symphonic repertoire is Beethoven and Brahms? JN: It is, and it requires enormous discipline within the community of the orchestra. BD: And also a different sound, especially in the woodwinds. JN: Yes. That’s a whole ‘nother subject. But why is it that there’s so much discipline in the ballet world? It’s because their values are different. The ballet is something of the body, something of the flesh, something of the eyes. It’s something of elegance. BD: Is it perhaps that ballet is painting brought to life? JN: It could be, sure. BD: Maybe there’s the connection. JN: Maybe that is. The Paris Opera Ballet is a stunning company. The ensemble, the corps de ballet, is phenomenal! It’s almost as good as the Russian school! It’s so much better than anything you see in Italy or in Germany. BD: Does the ballet we have in America come to that level? JN: I think it does because we’ve had Balanchine and we’ve had these people who have been transported into our culture. [See my Interview with Maria Tallchief.] What is our own culture producing in dance? It’s Alvin Ailey and Morris doing contemporary ballet. BD: Have you conducted some ballet? JN: I have only conducted ballet within the opera and I’m sorry I haven’t! I would love to conduct Daphnis and Chloé! I’d love to conduct Rite of Spring with ballet! Petruschka with ballet I’d adore! That’s really the way a conductor should learn that music, first by doing it the way it was originally written. BD: You wouldn’t feel a sense of loss later when you’re on a concert stage with no dancers? JN: I think you would just simply bring that into play in your own imagination, so you’d make the performance live better. Why is it that concert operas are so wonderful? Because one can imagine better than anything real. BD: It’s also a way of getting acquainted with repertoire they wouldn’t have the money to mount onstage. JN: Yeah, it’s true. But maybe it’s just because I’m a musician and my ears are stronger than my eyes, but I often prefer going to concert opera. Then I just close my eyes, or I imagine, or I just listen to the sounds of it, and I find it enormously rewarding. BD: Here in Chicago we have a couple of people who broadcast oldtime radio shows, and a lot of people say they prefer the radio over the television because the pictures are better! BD: Thank you for speaking with me today. I appreciate very much your taking time out of a busy schedule. JN: You’re very welcome. My pleasure. The distinguished American conductor John Nelson is one of the world’s most versatile and accomplished conductors. He is highly regarded not only for his great interpretations of large Romantic works and his stylish performances of Baroque music, but also for his vibrant Mozart and Haydn and his devotion to new music. 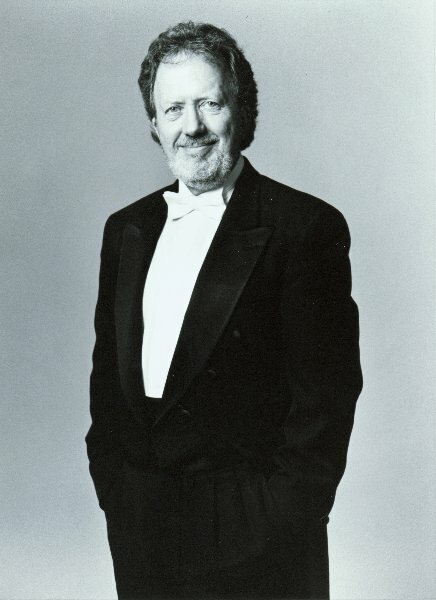 Born in Costa Rica, John Nelson studied at the Juilliard School where he won the Irving Berlin prize in conducting. 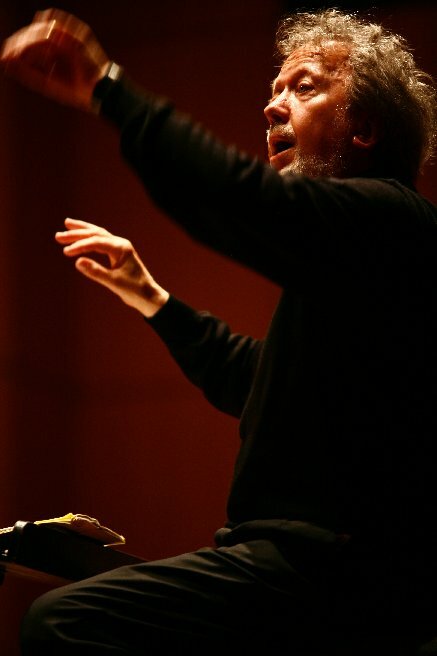 He has held the titles of Music Director of the Indianapolis Symphony, the adventurous Opera Theatre of St. Louis, and the Caramoor Music Festival in New York. He has also been principal guest conductor of the Orchestre National de Lyon and artistic adviser to the Nashville and Louisville Orchestras. Presently John Nelson holds the title Directuer Musicale Honoraire of the Ensemble orchestral de Paris. John Nelson conducts in virtually all the major cities of the world. In America he has appeared with all the major orchestras including the New York Philharmonic, the Los Angeles Philharmonic, the Philadelphia Orchestra and the symphony orchestras of Boston, Chicago, Cleveland, Pittsburgh and San Francisco. In England he has conducted the London Symphony, the Philharmonia, the Royal Philharmonic, the Halle, the Bournemouth Symphony and the Scottish National Orchestra. He has been engaged by the Leipzig Gewandhaus, the Dresden Staatskappelle, the Gurzenich Orchestra in Cologne as well as the Radio Orchestras of Hamburg, Munich, Berlin and Saarbrucken. Other European orchestras include the Suisse Romande in Geneva, the Academia di Santa Cecilia in Rome, the Maggio Musicale in Florence, and the orchestras of Oslo, Rotterdam, the Hague and all the major orchestras in France. A frequent visitor to the Far East, Mr. Nelson has conducted the New Japan Philharmonic, the Hong Kong and Shanghai Philharmonics, while down under has appeared with all the orchestras in Australia. Maestro Nelson made his professional opera debut at the New York City opera in 1972 in Carmen and his Metropolitan Opera debut in 1974 be stepping in on sudden notice to replace an ill Rafael Kubelik in Berlioz’ Les Troyens. It was this occasion that catapulted him into the limelight and led to his European debut at the Geneva Grand Theatre (Les Troyens) and his French debut at the Berlioz Festival in Lyon (Beatrice and Benedict). He has since conducted opera in major companies around the world including the Chicago Lyric Opera, Santa Fe Opera, the Bastille Opera, Lyon Opera, Rome Opera, La Monnaie, the Netherlands Opera and the Welsh National Opera. Central to John Nelson’s work is the interpretation of the great sacred choral literature for which he is renowned. In 1985, the 300th anniversary of Bach and Handel, Mr. Nelson was chosen to celebrate both composers’ birthday concerts at Carnegie Hall including the two Passions and the B minor Mass in a single week. His love of choral music has brought him to the Atlanta Symphony following Robert Shaw’s death to conduct the Brahms German Requiem, Beethoven’s Missa Solemnis and last season, Mendelssohn’s Elijah. His commitment to this repertoire and his concern for the lack of 20th century sacred works led him to found SOLI DEO GLORIA, Inc., a non-profit organization which encourages composers and conductors to promote great sacred works in our time. The latest work to be sponsored by SDG is Christopher Rouse’s Requiem, commissioned to commemorate Berlioz 200th anniversary in 2003. Recording has become an increasing activity in Mr. Nelson’s career. In addition to his many recordings with his orchestra and EMI he has also recorded with SONY, Deutsche Gramophone, Decca, BMG, Erato, New World Records and Naive. 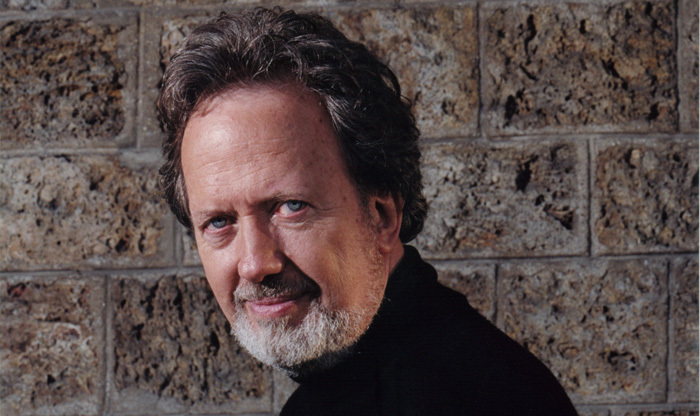 His awards include a Grammy for Handel’s Semele and a Diapason d’Or de l’année for Berlioz’ Beatrice and Benedict. Recently released is a DVD recording of Bach B Minor Mass filmed at Notre Dame in Paris with the Ensemble Orchestral de Paris , a recording of the complete Beethoven Symphonies cycle as well as Mozart Symphonies No 31, 39, 40 and 41 on Ambrosie label . Recent/future engagements include performances of Der Freischutz and Damnation of Faust at the Geneva Opera, The Trojans at the Stuttgart Staatstheater and the Netherlands Opera, concerts with the Sydney Symphony, Singapore Symphony and Hong Kong Philharmonic orchestras as well as DVD projects of Beethoven Missa solemnis with the Chamber Orchestra of Europe & the Gulbenkian Chorus, Haydn Creation and Bach St Matthew Passion with the Netherlands Radio Kammerphilharmonie and Radio Chorus. This interview was recorded in Chicago on October 4, 1993. Portions (along with recordings) were used on WNIB later that year, and again in 1996 and 1999. This transcription was made and posted on this website in 2009.